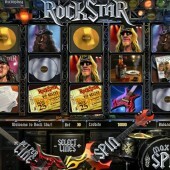 Having possibly the worst rock song ever made aside (thank heavens for the ‘Sound Off’ button), influential slot developer Betsoft Gaming have certainly got it right yet again with their slice of rock n’ roll on the reels, Rockstar. There’s a nice kerrang of the electric guitar noise when you alter your bet sizes. On the reels of this 5-reel, 30-payline slot are our members of the rock band on stage: a blonde goatee’d lead singer, a guitarist looking a little too much Slash out of Guns N Roses, a beefy drummer and the bandana’d up bassist. There’s also a hot female fan looking on adoringly, plus a copy of Spinning Stone magazine with the band on the cover, the customary bottle of Jack Daniel’s and a burning cigarette, a press pass and a record contract. The Wilds work in an interesting way. There are actually two Wilds – the gold disc and the platinum disc. Hit a gold disc alone and you’ll earn a 2x multiplier on all wins. A platinum disc Wild adds a 5x multiplier to wins, but if you hit both together you’ll earn a rrrrrocking 10x multiplier on winning combos. Wilds substitute for all regular symbols other than the Scatters. Three or more guitar icons left-to-right triggers our poodle friends to launch into an epic guitar solo where instant credits can be yours. Hit three or more VIP Access Scatters on a winning pay-line, meanwhile, and you’ll trigger the Bonus Round. It’s essentially a Pick ‘em bonus round with a little skill thrown in for good measure. You will be awarded cash for every correct rrrrrock note you hit on the instruments. If you hit a big win the band will come on and assault your eardrums with some rock riffs. There are some lovely features in Rockstar, but considering this is a Betsoft joint, that’s to be expected. The animation is nice, the music – although hardly Led Zeppelin – adds to the atmosphere, but the bonus rounds are pretty hard to hit. There are no Scatters in the game so I found myself desperately trying to hit combos from left-to-right on the reels. 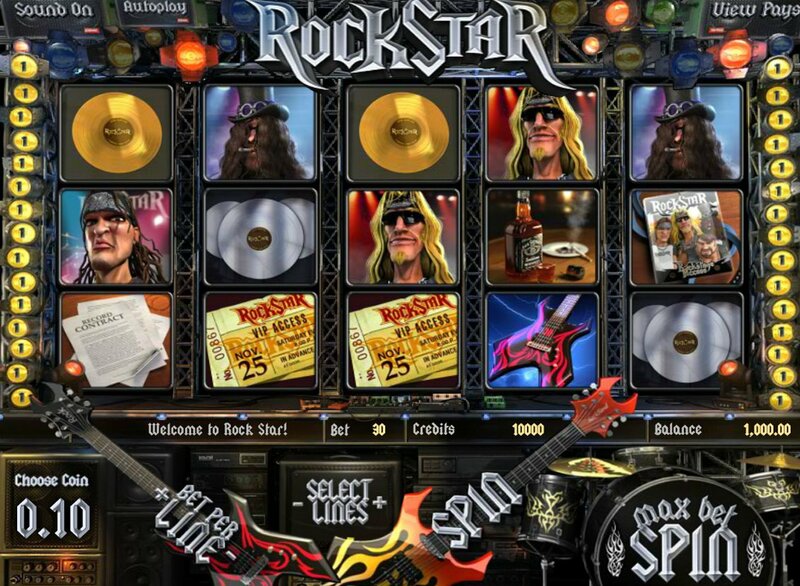 As for other rock-themed mayhem in online slots, check out Microgaming’s big TV-tie in slot, The Osbournes, or Leander Games’s straight heavy-metal riff, Megadeth, based on the career of the legendary thrash metal band. At least with the latter you get some authentic rock madness.